PortSide has been working on this project over the years by creating paper and digital guides to Red Hook. With funding from Councilman Carlos Menchaca and the Department of Cultural Affairs, Red Hook WaterStories reached new levels with work that began January 2016. The work started with a need to collect and catalog a large body of existing research (images, essays, oral histories in sound and video) and then assemble that into a public web solution. A major goal was map the content and turn the peninsula of Red Hook into an educational experience and attraction. The team needed to classify and tag the content, and also be able to present the information on a map. 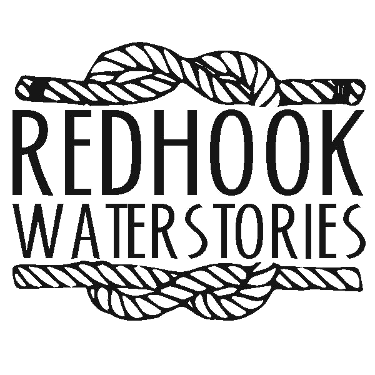 In addition to historical items, Red Hook WaterStories would also include current neighborhood businesses and resources, and other information for residents and visitors to Red Hook. David Levine joined the team in January 2016 and headed the technical design, information architecture and implementation of Red Hook WaterStories. He analyzed the requirements of the project, and also selected a project management solution for the team to track its work and schedules. The team was advised by several advisors early in 2016 to look at Omeka, a content management and web publishing framework created by the Roy Rosenzweig Center for History and New Media at George Mason University (Fairfax, Virginia). Omeka provided the team a perfect way to collate and classify its collection, and tag it by subjects, names, dates, etc. Omeka is highly customizable on how to present that information to the public. So Red Hook WaterStories got two solutions in one package from Omeka. The team set up an Ubuntu Linux server (generously provided and hosted by Silicon Servers) running Apache, PHP, mysql, and Omeka and its required plugins. The Curatescape theme is the foundation of the look of the site. It gave the site a great leg up in making the site very usable and beautiful on desktop computers, as well as smartphones and tablets. Curatescape was developed by the Center for Public History + Digital Humanities at Cleveland State University. The needs of Red Hook WaterStories were beyond what Omeka and Curatescape provided out of the box, so the team iterated for several months on the design, and David coded and configured the application, crafted the web styles, and imported and manipulated data feeds. The interactive map included with Omeka and Curatescape is built on top of leafletjs and Leaflet.markercluster. The interactive map is backed by a modified version of NOAA Chart No. 12334, edited in GIMP and then geocoded using QGIS. The map was pre-processed using GDAL, and is served up as WMS tiles by GeoServer running under Apache Tomcat. API data from Citi Bike, the MTA and MarineTraffic is sync'ed to Red Hook WaterStories using Perl scripts and converted to a JSON format. Several custom element types were configured in Omeka. Image display is customized using fancybox to provide the "lightbox" experience. The team had great, quick support from the Omeka user forums and also from the digital team at NYPL Labs. Data was imported from NYPL's OldNYC site using wget and Perl, and then imported to Omeka using its CSV Import plugin, which magically retrieves image files from other sites. PortSide NewYork has shared back the code of Red Hook WaterStories on github in rhws-curatescape-theme. It remains a work in progress. Many different sources were used in researching Red Hook WaterStories. A few deserve special mention including the Brooklyn Public Library, The New York Public Library, fultonhistory.com, hathitrust.org, and nyshistoricnewspapers.org. In May 2018, PortSide NewYork launched Red Hook WaterStories version 2.0 with more content, updated software versions, and design updates. New content is regularly being added.